Goodbye 2018: Things I Accomplished (and Also Unfortunately Didn’t) This Year! Hi, I’m May and sometimes my self-worth depends on my productivity. I love opening up posts with lines that are way too personal!!! Okay, but I’m like actually 100% serious about this. I know it’s bad and it’s a really destructive mindset to have but I’m working on it!! Today, as a part of me attempting to improve, I’m writing a completely unbiased post about what I have and haven’t been able to accomplish this year. I’m not judging myself for what I couldn’t do, because I deserve to be good to myself! Being less stressed over grades! This mostly started happening near the end of the year, but it’s such a big accomplishment because I’ve always been a huge worrier over grades. And now I’ve finally been able to let it go if I don’t get a Perfect Score because that is! next to impossible! Reading books I enjoyed! Like I talked about, I’ve rated books a lot more highly this year than before, and I truly think it boils down to me just getting better at picking out books I think I’ll like. Which has just led me to have an overall better reading experience (even if I’m struggling to hit 100 books for the year!). Also, reading more webcomics? This is for the end of the year (November and December) because I’m rushing to finish my Goodreads challenge, but I’m SO glad I got into a webcomic kick because there are so many good ones—On a Sunbeam is actually a favorite book of the year for me!—and I’m excited to read more in 2019! Writing things I’m really proud of! Usually whenever I write stuff, I end up not liking it later, which I’m sure other people can relate to. But this year I’ve actually written stuff that I’ve stayed proud of and I’m really happy about that! Writing almost 25K of my WIP! While I didn’t actually reach the set NaNoWriMo goal, I’m proud of myself for writing as much as I did, and I feel like I could really go somewhere with this WIP. This is definitely a source of pride for me and I’m happy about it (since it’s hard for me to feel proud about my writing a lot). 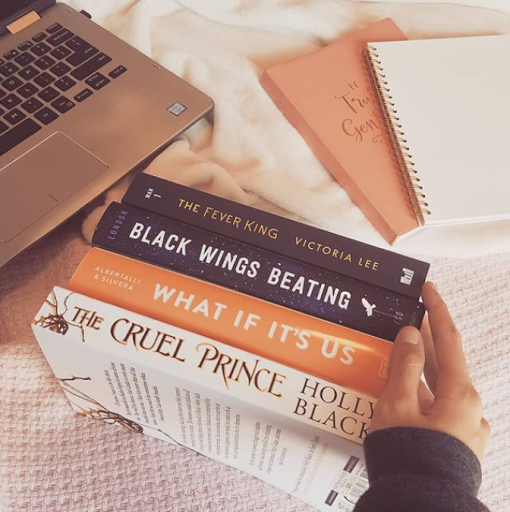 Starting a bookstagram! I’ve always loved the idea of taking pictures of books, and I’m really glad I started a bookstagram this year because I love taking photos and feeling proud of how they turn out. Becoming closer to/made more friends!This year I feel like I really made a lot of new friends online by pushing myself to really branch out and interact (at least on social media oops). And while I haven’t really made any new friends irl, I’ve grown closer to a lot of my existing friends and I’m proud of myself. Hitting 1.5K followers on my blog! This was one of my goals for 2018 and I really didn’t think I’d make it, considering how poorly I’ve been at blogging this year, so I’m really proud of this! Actually… being a good blogger? Hi yes, you all know this but this year I just sucked at interacting and actually being a blogger besides posting stuff! And I hate it so much, but I’ve already beat myself up about it so I won’t say anything else about it other than the fact that I plan to actively change this in 2019. Managing time and stress. I think I’m always going to have this problem but I thought in 2018 I’d be a lot better at it?? (What a nice, oblivious time that was.) There are so many times where I could have NOT procrastinated and saved myself a lot of stress, but I didn’t. Really truly going to try and fix that in 2019… at least at first?? Watching the TV shows I wanted to. I’m writing this the night before I go on a road trip when I might watch The Good Place, but I’m sad because the only show I got to watch that I’ve been wanting to watch was Brooklyn 99. Which was an excellent choice, but I want to watch more!! Branching out in music. I mean, listening to Brockhampton was a pretty big branching out since I almost never listen to hip hop/rap. But I feel like most of my listening is resorted to one artist for a month (or more than a month, in Brockhampton’s case), which limited how much music I really listened to. what are some things you accomplished this year? do you have any music/tv show recs for me? what are some standout books you read? if you have a bookstagram, feel free to link it to me!! Previous Goodbye 2018: My Most Favorite and Least Favorite Moments of the Year! Next Goodbye 2018: Seeing How Well I Did on My Goals for the Year and Making New Resolutions for 2019!! I’m glad you didn’t stress out too much about grades, and tbh chances are you’e being harder on yourself about the stuff you didn’t accomplish. I DID stress about grades and studying…alot. but I also made new friends, started communicating with people in my life more, and ate (somewhat) healthy. I hope the new year brings good things your ways! Honestly, you gushing about webcomics makes me want to read them. They all sound really cute and heart-warming but I don’t know, maybe I’ve been fooled and they’re heartbreaking and make you cry. Also, I think I’m going to delete my bookstagram because I never use it + it’s really ugly and I’m not happy with it. I’ll probably like keep my account to stalk other people and stuff, but not post on the account and delete all my photos(?) BUT YOUR BOOKSTAGRAM is gorgeous, your theme is so soft and pretty!! And like, i love it. Honestly, being proud of your writing is so hard but I’m so proud of you writing amazing things and liking them yourself and being proud over them, that’s so amazing!! And OOPS, I relate SO HARD to managing time and stress. I feel like I procrastinate so much and then PANIC when I realise how much I have to do??? UGH. I really want to change this in the next year!! You accomplished so much this year, May, and I’m so proud of you!! 💞 I started caring less about grades this year, too, but it was because of senioritis, whoops. 😂 I really hope you’ll participate in more self-care in 2019 (I need to do so too, lmao), because you deserve it. 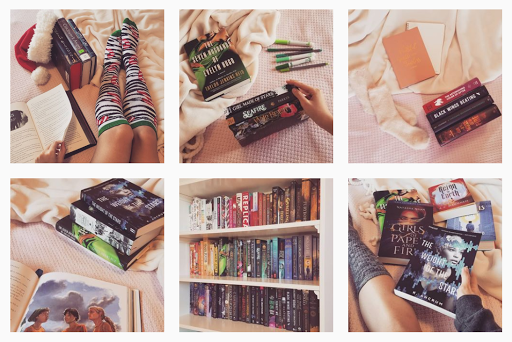 I love your Bookstagram so much, and I’m so excited to see it grow! Every single one of your pictures are gorgeous 😍 And YES, Brooklyn 99!! 💙 And I love The Good Place as well; it’s both hilarious and thought-provoking – I hope you’ll love it too. Wonderful post as always, May! I hope you’re having a great holiday season! Congratulations on all your accomplishments! I hope you have a great 2019! Because of you I now want to read so many books and webcomics. Because of you, I figured something out (you know. THAT.). Because of you I am where I am right now in the blogging world and in my real life. You are such an inspiration to me May and I hope you know that. Sending so much love and hugs your way 💜💜💜 and thinking of you for 2019. Congrats on all the things you accomplished! Writing a lot is a wonderful accomplishment! And On a Sunbeam was easily my favorite graphic novel of the year 😊 And for the things you didn’t get to – that’s what next year is for, right? 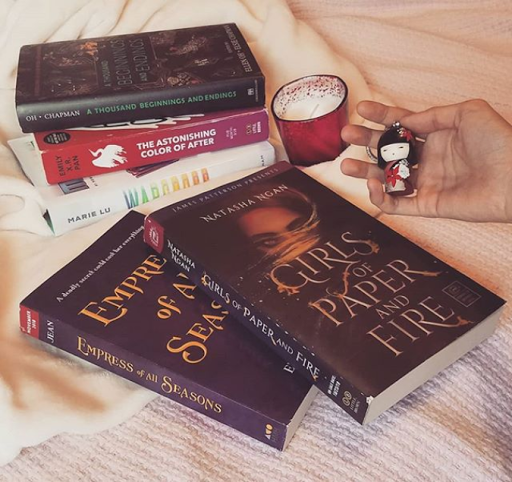 Your bookstagram photos are always so fantastic! And congrats on writing 25k!!! I can totally relate to wanting to watch more of my fav tv shows. I really want to start watching Brooklyn 99 and finish Madame Secretary. It just takes time! Away from reading! Congrats for all you did accomplish!!! I think being good to yourself, even when talking about the things you couldn’t accomplish, is very important. I know I’m certainly not that good to myself most of the time, and that’s definitely something I hope to improve for the new year. I think you accomplished a lot of amazing things, especially writing things you are proud of as well hitting 1.5k followers. That’s amazing! Do you have any posts with webcomic recommendations? I really want to start reading more of them, and would love to know which ones you liked and which you feel like are not worth my time.